Unfortunately going through them is going to take a while. I vowed to try and be more judicious in the use of the shutter button, but failed miserably – I ended up with over 1100 pics from Cosfest alone. Sorting through them is one thing, then I have to denoise, color correct, white balance, sharpen, etc. So you will see pictures coming up in fits and starts over the next few days. Also, you will see a lot of pics with legs and feet cut off. Unfortunately the stage was set up in such a way that peoples’ lower halves were frequently blocked by stage equipment. (Why do they have to put those speakers at stage level? Can’t they put them off to the side and/or at ground level?) Wherever I needed to cut something, I tried to do it in the least gruesome manner possible. Finally, while I did get video of the event, it’s kind of crappy. (Consumer grade camcorders such as the one I have aren’t well known for their low light performance) I’ll do what I can to fix this, but there’s not really much I can do at this point. Oh well. At least you’ll get to hear their skits. So where can you view these, you might ask? Well, pics will be posted to our Flickr account (or you can check out our handy dandy Photo Gallery page), and video will be on our YouTube channel. 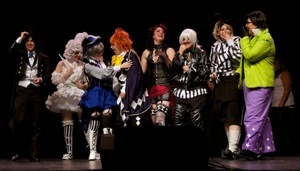 Finally, for the list of CosFest winners, look below the cut.